When newspapers die, do they go to heaven? Today I read about another newspaper that is shutting down and will switch to a semi-annual magazine format. Which newspaper? Why it’s none other than my hometown’s award-winning Warrior’s Word high school newspaper. I understand the problems that caused Warrior’s Word to “adjust” are a bit different than those of the Minneapolis Star-Tribune, but if the economy and budgets are so bad that a high school newspaper is closing, we have to ask ourselves: What’s the solution? It’s no secret that blogs and online news videos are entertaining, informative and can provide a surprisingly high level of journalism. Hell, sometimes I’d rather read Gawker, The Huffington Post or watch Philly D. than read an article in the New York Times, but that doesn’t change how important newspapers are to our society. We need professional journalists and news organizations that have the resources to uncover scheming politicians, and the column inches to educate people about tough issues like health care. We need journalists who report the news accurately and fairly, despite their personal views and opinions. In short, we need the type of in depth, professional reporting our newspapers currently provide. While there are a lot of people who love ink stained fingers, the “paper” in “newspaper” may have to go. If newspapers cut the cost of a printed product they will have more money to invest in their online product. The Capitol Times in Madison, Wis. switched to a twice weekly tabloid and online-only product in April 2008, and so far it seems to be working. Create hyper-localized text message offerings. Is the power out in your neighborhood? Wouldn’t it be great if you could sign-up for text message alerts (which include a link to a story) that tell you this type of news? Hire news staff to be on the clock 24/7. The harsh reality is newspapers are competing with all media outlets. When news breaks on Twitter you want readers to go to JSOnline.com, not WISN-TV or WISN.com. Better and more diverse online content will continue to increase online visitors, not to mention the increase in web traffic from people who used to read the “paper” version (let’s be honest, 99 percent of them are online anyway).This all increases ad revenue and eventually profit. I know these few ideas are probably not going to save our newspaper industry, but it’s a start. After all, if Perez Hilton can sustain over 2 million unique visitors a month, our newspapers should be able to do the same, if not better. What are your thoughts? Where do you see the newspaper industry going? I first saw this video on Todd Defren's blog, PR Squared. * I'm sure a lot of you have seen it, but I think it deserves another view. It's a satirical take on the agency-client relationship. 'Nuff said. *PR Squared is one of my favorite industry blogs. Defren provides valuable insights on social media, public relations and what working in an agency is really all about. I highly recommend you check it out. Yesterday was the big day. The PR + Social Media Summit at UW-Whitewater. Apologies to all my Twitter followers who were annoyed by my frequent #PRSMS updates. Overall, I thought the summit was very informative and provided some great networking opportunities. My one recommendation for next year is to supply extension cords and power strips throughout the conference rooms. Those of us using laptops were forced to either drain our batteries, or sit on the edges of the room in search of an outlet. Where social media is concerned your first job is to listen, second is to engage and third is to address criticism. Southwest started the “Nuts About Southwest” blog by handpicking 30+ employees from all different departments. Southwest let their employees blog as often as they wanted and encouraged them to blog about things they were passionate about. Once Southwest added more valuable content to their blog (photos, news, podcasts) page views rose. Southwest's blog proved to be a great resource for conducting focus groups. A blog post about their open seating policy resulted in hundreds of comments. Most praised the company for its policy and gave them the courage to stick it. Rapping flight attendant video resulted in coverage on Oprah, CNN, Tonight Show, etc. During my presentation I discussed ways to create a successful online brand by merging your professional and personal identities. And yes, I also discussed my brief moment of so-called "fame" from February. View more presentations from Sarah Soczka. I am told all the presentations will be posted online within the next couple weeks. (I will link to them once they’re up.) If you are interested in learning more about the PR + Social Media Summit, Abby Gutowski has also posted an overview here. What were your thoughts on the summit? EDIT: To view photos of #PRSMS visit http://bit.ly/c3DQs. 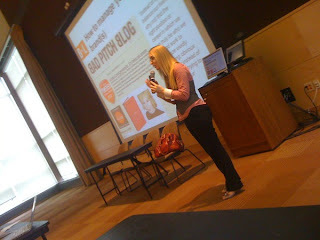 To download videos and audio of Southwest Airlines and Harley-Davidson's presentations visit http://itunes.uww.edu. I've been spending a lot of time preparing for the PR + Social Media Summit at UW-Whitewater this coming Wednesday. I have been invited to speak about personal and professional online brands. I hope you'll come to my breakout session. Until then, I wanted to share this adorable TV spot from Hillshire Farm. It's part of their "GO MEAT!" campaign. Enjoy!